Against all the odds I’ve survived another year so you will now have yet another missive to throw away; without bothering to read further if you’ve any sense. If you have ignored my suggestion then you’re duty bound to finish!! It has been a year of ups and downs, though fortunately the ups have the ascendancy. 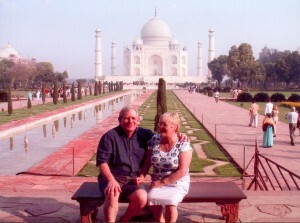 Having survived the Christmas and New Year and the miseries of most of the winter we took off to India again in late February on a tour of the Golden Triangle, Delhi – Agra – Jaipur. A totally different experience to that of Goa as it was a guided tour of the sights and sounds. The Taj Mahal was definitely the highlight of the trip and it is impossible to do it justice in words, or even pictures, you really have to be there. I will not bore you with details of the whole holiday, but just say that everybody should go there at least once and it was good enough for us to decide that we will be back in India again next year, hopefully to Kerala in the south. Unfortunately we had to have one of the Westies put to sleep shortly after we got back. She has had the skin complaint common to the breed but it got to be too bad to treat. Still have the other two, Bridie is 12 now and her daughter Orphan Annie 8. They don’t know they’re dogs – get better treated than I do. Ireland is slowly getting into the 21st century; in fact it’s probably ahead of a lot of places including the UK. They have worked the EU system well enough to have got enough money to build an enviable network of main roads and motorways which, unfortunately, stop when ones gets to the NI “border”. Where they couldn’t con the EU into paying they have built toll roads. Nobody seems to complain, just glad to be able to keep on the move. It now only takes 5.5 hours to drive the 280 miles from Belfast to Cork – used to be 8!! The Irish banks are not doing so well at keeping a track of things mind you – Two individual solicitors have managed to run up debts of around €200,000,000 between them by remortgaging their properties, without telling their new lenders they were already mortgaged. On the political front we now have the unbelievable double act of Ian and Martin; (affectionately known as the Chuckle Brothers) and who would have ever thought we would have Gerry and Mitchell telling hard line “shinners” to help out the PSNI (RUC), other than by beating themselves up. Long may it last. The Ulster Unionists and the SDLP are now running round wringing their hands and complaining they aren’t being taken seriously. 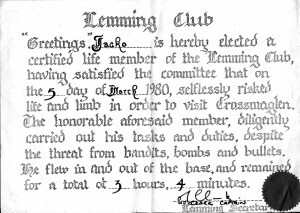 As a reminder of what it was like in the bad old days I give you” the “Lemming Club Certificate”. For those not in the know, this used to be issued by ”E Troop”, Girdwood Barracks, Belfast, to all those who were “helicoptered” to Crossmaglen, jumped off (no landing in those days) and stayed for a while and managed to get back out again. It is signed by Bill (Sniffer) Clarke the then OC. We don’t get everything right though -, our Education minister has decided to do away with the 11+ after next year; currently we have the best education system in the UK, but nobody has agreed what to replace it with. The latest idea is to have transfers at 14. . Who is going to pay for modifications to schools and think out all the implications of continuing Primary has not yet been addressed of course. No doubt it’ll all work out OK, to be sure, to be sure. Peter, now 22, started working for me in September. He finished a HND in construction but had not had any decent job offers and was working in as a floor supervisor in Costcutter (a sort of cheapskate Spar). Wasn’t going anywhere there – lousy pay and hours – and I needed a “gofer” in the sales office. Nothing like a bit of nepotism! He has taken to it well so there is hope for him yet. He’s got himself a girlfriend as well – been going together for nearly a year now. Our eldest granddaughter, 21 last month, is also courting – where will it all end. Having got my low blood pressure sorted out last year I thought that there wasn’t much that could go wrong. I picked up an awful cough in the autumn which antibiotics didn’t shift. To cut a long and uninteresting story short I was diagnosed with COPD (modern catch all respiratory disease which can include emphysema/chronic bronchitis etc); the good news is that modern drugs, whilst not being able to cure it, can at least control it. Doesn’t interfere with the golf too much anyway. Josephine and I took ourselves off to Lanzarote for a week at the beginning of November which worked out quite well given the above. Weather was great and the sea food in the restaurants in Puerto del Carmen would take a lot of beating. We stayed in the Fariones Apartments and it was as good as a 4 star hotel. The service and food were faultless. It has also been a year for coming across old friends: I would say very old, but could then be accused of being ageist as well as prejudiced. (Believe it or not one of my staff accused me of being ageist and sexist – coming somebody with the interpersonal skills of Attila the Hun I was a little put out) It started with Terry Ireland, who is in contact with about half the “class of ’62” ANSI contingent from 13, then Bob Crook, Dave Morgan and Keith Clarke, followed by Linda Cottrell and lastly, but by no means least Eric and Christine Ross. If anybody has any pictures especially of the 62-64 eras (Maresfield/13Sigs) I would love a copy). It is the a period for which I have only one or two photos. Well that’s yer lot for this year, if you got this far give yourself a round of applause and a large Irish.